28 September 2018, 7pm at Windsor Parish Church, Windsor, England. Beyond Conflict’s Board is delighted to announce a gala concert performance of The Cry: A Requiem for the Lost Child by Adrian Snell. Adrian’s music was originally inspired by the Children’s Memorial at Yad Vashem in Jerusalem. 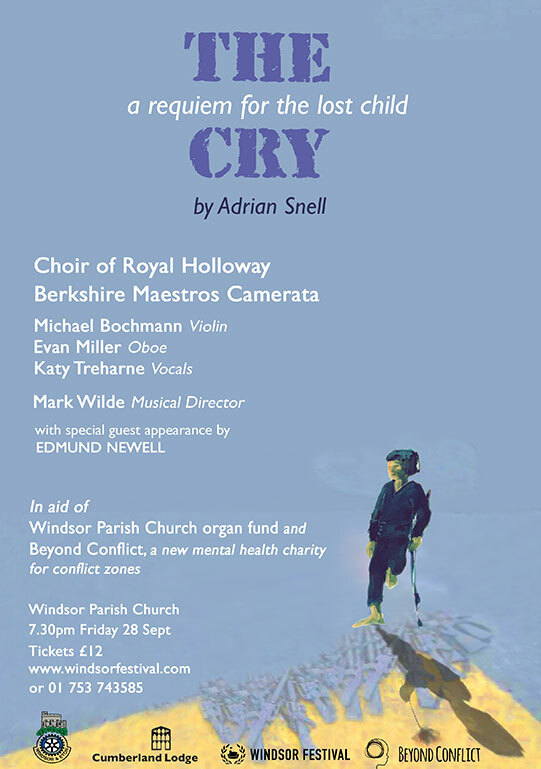 The Cry will be performed by a string orchestra, a children’s choir and the renowned Choir of Royal Holloway College. The concert will be the finale of the 2018 Windsor Festival and take place at the beautiful and historic Windsor Parish Church of St John the Baptist, in the shadow of Windsor Castle on the High Street, in aid of our charity. This is our first fundraiser in the UK and we want to make the concert a sell-out. It is in association with The Rotary Club, Cumberland Lodge and Windsor Festival. The performance will be followed by a drinks reception hosted by Beyond Conflict. Tickets are £12 and can be ordered from www.windsorfestival.com, 01753 743585. Monies raised during the evening will go to Beyond Conflict and the church organ fund. The evening will be directed by John Halsey, Director of Music at the church). Beyond Conflict thanks all concerned for their support.